08-Jul-2015 -- On 8 July we left Travemünde (Germany) on board the ferry “Finnlady”. Some confluence points were passed on route to Helsinki (Finland), among them 57°N 19°E, yet left unreported. Our best approach was at 7:00 p.m., in an estimated distance of 12 km. 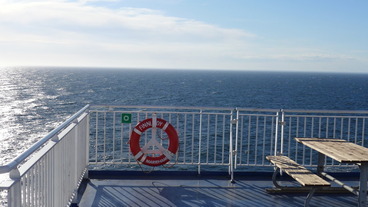 The ship passed between the CP (located in the Baltic Sea) and the southern end of Gotland (Sweden). The coast of this island was visible in the West. View East is towards the CP - only water, as well as views N and S, thus not shown. Way out in the Baltic Sea, Gotland might be visible on a clear day.